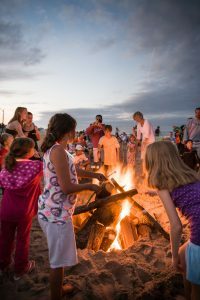 Dewey Beach Summer Movies and Bonfires Start July 2! 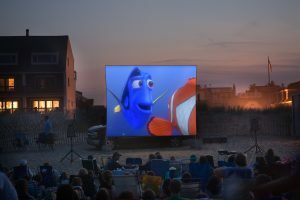 Dewey Beach, DE (June 28, 2018): The Rehoboth Beach – Dewey Beach Chamber of Commerce along with major sponsor Weis Markets provides your family with movies and bonfires on the beach in Dewey this summer. FREE PARKING IN DEWEY BEACH – Monday-Wednesday, 5 – 11 p.m.
Notice of cancellation will be posted to the Rehoboth Beach – Dewey Beach Chamber of Commerce’s Facebook page. Staff will notify Dewey Beach accommodations of cancellations made prior to the start of an event. If weather is clear, events will take place as scheduled but may end early due to weather conditions. For more information, call the Rehoboth Beach-Dewey Beach Chamber of Commerce at (302) 227 – 2233 or visit the Chamber website at www.beach-fun.com. Photos courtesy of Carolyn Watson Photography.